London – Much to the excitement of Alice Cooper group fans worldwide, Gonzo Multimedia will be releasing Michael Bruce’s critically acclaimed biography “No More Mr. Nice Guy” in a Limited Edition Box Set! The Box set contains a signed certificate, book, 1996 interview CD, and reproduction of Alice Cooper group memorabilia. Limited to 250 Units, and signed by Michael Bruce. The 1973 return to the band’s more hard rock roots was a successful creative choice and catapulted Muscle Of Love into Billboard’s Top 10 Album Chart. That sound, complete with the prog-rock/heavy metal workouts, has proven over the years to be a significant piece of the Alice Cooper legacy. 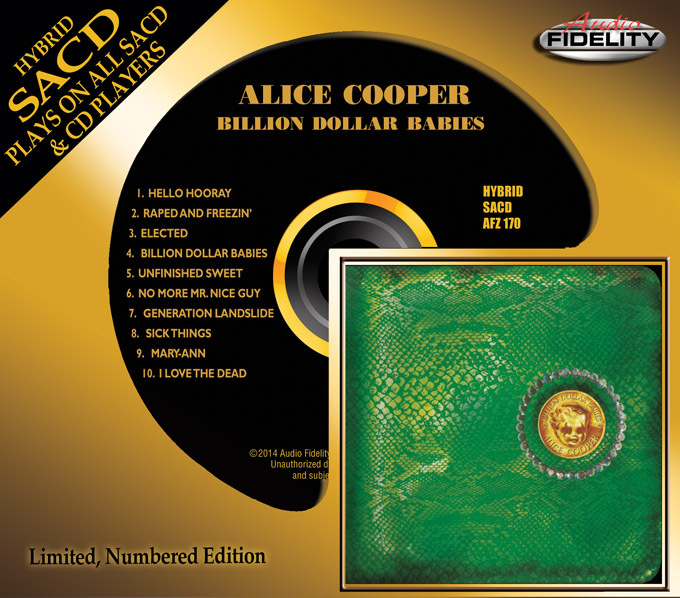 Audio Fidelity To Release Classic Alice Cooper Album ‘Billion Dollar Babies’ On Hybrid SACD On February 4, 2014! Camarillo, CA – Alice Cooper fans worldwide rejoice! Marshall Blonstein’s Audio Fidelity is releasing Alice Cooper’s classic album ‘Billion Dollar Babies’ on Hybrid SACD on February 4, 2014! As a bonus, along with the meticulously reproduced artwork, enclosed in every CD is the very collectible replicated ‘Billion Dollar Bill’. With ‘Billion Dollar Babies’, Alice Cooper refined the raw grit of their earlier work in favor of a slightly more polished sound resulting in a mega-hit album that reached the top of the US and UK album charts. It’s impossible to overstate how popular the band had become by the time their sixth album was released. The album, is brilliant, decadent and encapsulated all the celebrity trashiness of the 70’s only three years into the decade. Song for song, ‘Billion Dollar Babies’ is probably the original Alice Cooper group’s finest and strongest. The album’s singles “Elected”, “Hello Hooray”, “Billion Dollar Babies”,and “No More Mr. Nice Guy” all became hits on the Billboard Hot 100. Also included are a pair of perennial concert standards – the disturbing necrophilia ditty “I Love the Dead” and the chilling macabre of “Sick Things”.